Last year there was hygge. This year it was all about the Swedish notion of 'lagom', otherwise known as the Goldilocks philosophy, which encourages us to live a balanced life of not too much but not too little: in other words, just the right amount. For 2018 the new buzzword is 'wabi-sabi' (or is that two words?). Wabi-sabi embraces natural flaws. Image via Pinterest. Although it too is of Japanese origin it's not be confused with wasabi (the hot, mustard-y flavouring most commonly used on peas which are sold for an extortionate price in North London gastro-pubs). Wabi-sabi is the new lifestyle concept that we're all going to be embracing. Apparently. As with 'hygge' and 'lagom' there is no literal translation of wabi-sabi. The meaning has evolved over centuries but these days wabi suggests a rustic simplicity or understated elegance whereas sabi typically refers to the beauty that comes with age and the inevitable decay. Put simply it is about finding beauty in imperfection. From a design point of view the wabi-sabi aesthetic celebrates the flaws in an object: the age-worn patina of metal, the asymmetry of handmade plates or bowls. It is these quirks that make them unique and which are also a reminder of of the passing of time. The idea is that by learning to love the blemishes and by repairing the cracks, instead of replacing everyday objects with new we can cherish them for longer, thereby reducing consumption and waste. The wabi-sabi colour palette is neutral and subdued, with shades of white and earthy tones. Image via Pinterest. As someone who has gone from having to have my place showhome ready to actually liking things to be a bit rough around the edges I can totally get on board with this concept. I like that my sofa is completely battered - it makes it more comfortable. My favourite pair of boots that I've had for years are falling apart but I can't bear to throw them out. And it's a great reason not to make my bed! 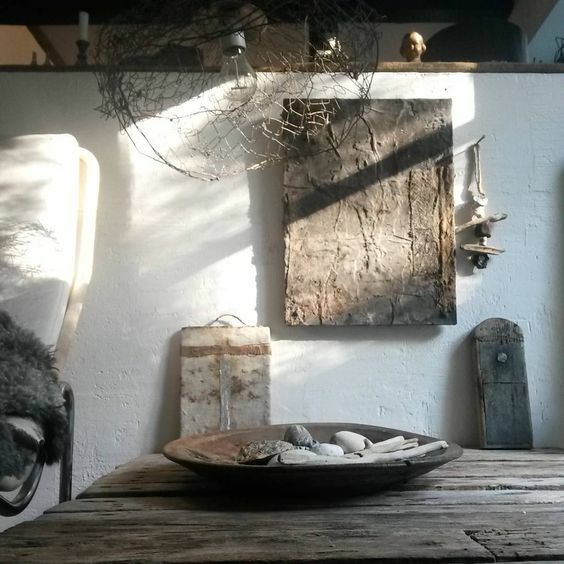 Materials in the wabi-sabi home are organic and tactile. Try a jute rug and crumpled linen bedding. Wooden furniture and tarnished metal add to the look. Image via Pinterest. By not striving for the western interpretation of 'perfect' and understanding that real beauty is found in appreciating the anomalies perhaps we would all be a little more relaxed and, ultimately, happier. In the words of the wisest of men, Noel Gallagher, "True perfection has to be imperfect." I think he's on to something.